Chewy soft pretzel meets sweet cinnamon roll in these Pretzel Cinnamon Rolls with Cream Cheese Glaze. They’re a labor of love, but trust me, you won’t regret the labor. Kevin would claim he loves everything I make, but I know by the way he picks at anything with quinoa or Brussels sprouts in it, that’s far from the truth. It’s sweet that he tries to pretend, but I’m on to him. When others question him on what his favorite items I make are, his answer usually alternates between any of my homemade pastas, enchiladas or sticky buns. Admittedly, there has been quite the drought in sticky bun preparation as of late, you know since I had a child and all that, so I’m willing to bet that’s what his answer would be today. Despite the absence of sticky buns, lately I’ve been baking up a storm, at least compared to what I was in Teddy’s first year of life. My traditional sticky buns are on the list to make in the next couple weeks, but for now, today’s Pretzel Cinnamon Rolls will have to suffice. 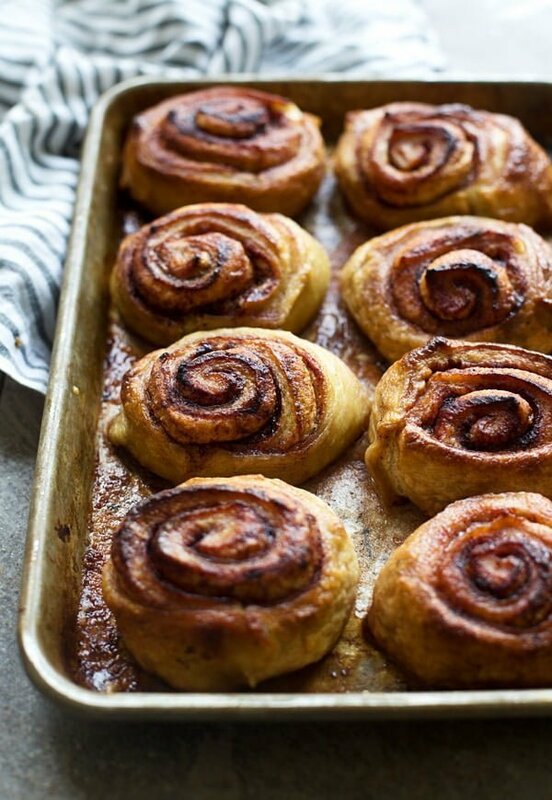 The idea for these a few months back when my girlfriend Meghan told me she somehow butchered a batch of homemade soft pretzels, but instead of throwing the dough away, she just used it to bake a batch of cinnamon rolls. I thought the idea was pretty genius, so I took it a step further and wondered if I could continue the process for making pretzels even after the raw cinnamon rolls were formed. I had no idea how it was going to be done, but figured I might as well give it a shot, because it’s not something I’ve ever seen before, and if I’m being perfectly honest, I secretly relish being the first to try something out. To say I lacked confidence the first batch would turn out is a severe understatement, I was CERTAIN it would take me at least three or four tries. I had so many questions to start with. 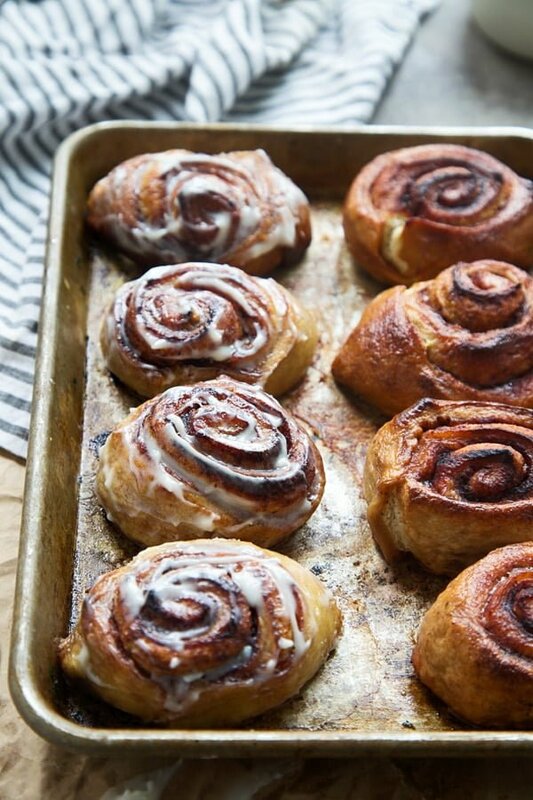 Would a formed cinnamon roll hold its shape in the baking soda bath? Would the entire filling come out? Could the cinnamon and sugar taint the pretzel dough and prevent it from having that beautiful golden sheen after baking? I carefully thought about the process beforehand so I could minimize any unnecessary fourth or fifth attempts, and much to my surprise, batch number one came out impeccably. Here’s how I did it: Once the pretzel dough rises, it’s made the exact same way as a traditional cinnamon roll. The dough is rolled out, it’s brushed with plenty of melted butter and then generously sprinkled with a cinnamon and sugar mixture. The dough is rolled up, jelly roll-style and then cut into 1 ½ inch rolls. Because I was worried the filling would seep out during the boiling process, I closed the bottom of each roll by pinch the dough together so that only one cinnamon sugar-laced end was exposed to the baking soda and water mixture. 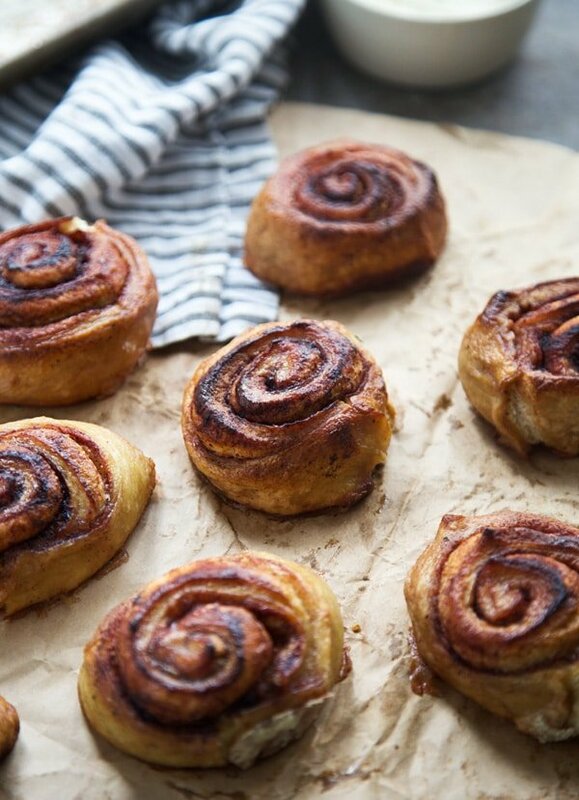 After each roll was boiled for one minute (30 seconds on each side), they were lined up in a rimmed baking sheet, brushed with egg wash and baked until golden brown. Because sugar has a tendency to burn, I baked them in the bottom rack of the oven for about 10 minutes, and then finished them off on the middle rack for another 5-10 minutes. After they cool off for a quick minute, they’re conservatively spread with cream cheese glaze and ready for eating. I do suggest serving these the same day, and preferably straight out of the oven since pretzels are a bit denser, they’re really not as good the next day. And I want to reiterate the AS in not as good, because they are still delicious the second day, they just don’t taste the exact same as they do immediately upon leaving the oven. In the bottom of a stand mixer, combine water and ¼ cup of sugar. Whisk in yeast. Let set for 5-10 minutes until foamy. Add in salt, flour and melted butter. Using the dough hook, mix the dough until combined on a low speed, Increase the speed to medium and mix for another 5-7 minutes until dough becomes smooth and pulls away from the sides of the bowl. Rinse bowl off and then grease with non-stick cooking spray. Place dough in, coating the ball with oil. Cover with a kitchen towel and place in a warm place. Let rise for 35 minutes or until doubled in size. Place one rack in the bottom third of the oven, place the other on the middle rack. Preheat oven to 450 degrees. Grease a 9x12 baking dish. Once the dough has risen, roll into a 12x17 rectangle. Combine remaining sugar and cinnamon in a small bowl. Brush with melted butter. Sprinkle with cinnamon sugar. Roll up jelly roll-style. Pinch to seal edges, I even like to pinch a second time to make sure everything is sealed. Cut into 1½ inch rolls. 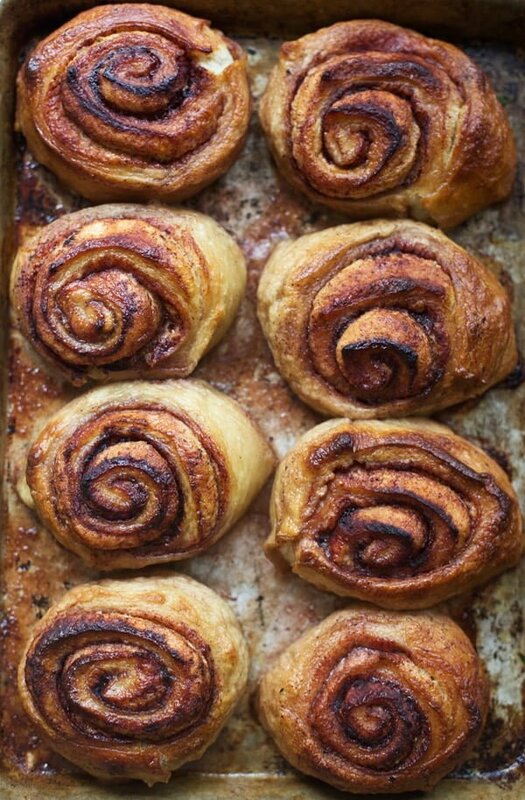 Pinch the bottom of each roll to seal, the cinnamon sugar swirl should not be showing on the bottom. Reform into a roll if necessary. Bring a large stock pot to a rolling boil. Add baking soda. Working in batches as necessary, drop cinnamon rolls into the boiling water, exposed side first. Cook for 30 seconds. Flip and cook another 45 seconds. 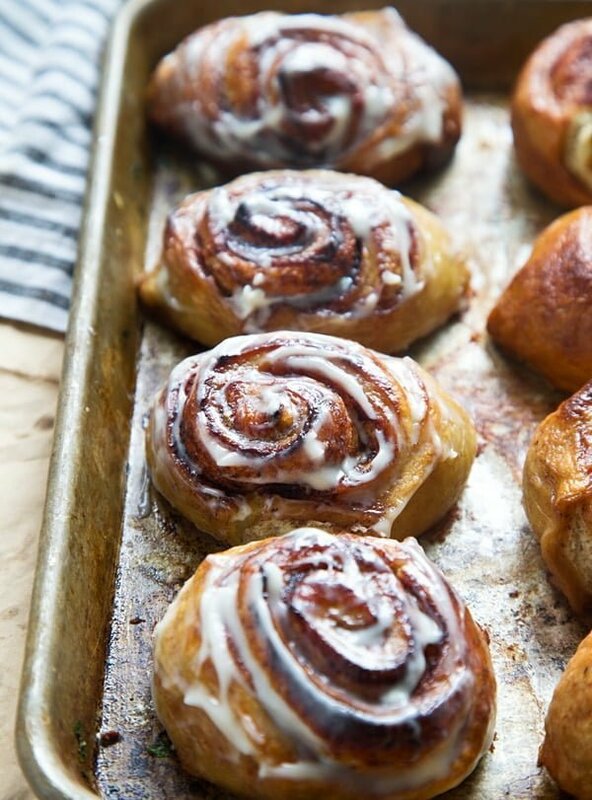 Use a slotted spoon to remove rolls from water. Drain on paper towels and then line up in prepared dish. Brush pretzels with egg wash and bake on the bottom rack for 10 minutes. Move to the middle rack and bake for another 5-7 minutes or until golden brown. Let cool for five minutes and then spread with glaze. Sprinkle with flaked salt if desired. Make while pretzels are baking. Add butter and cream cheese to the bottom of a stand mixer fit with the paddle attachment. Beat on medium-high until smooth. Add vanilla, beat until smooth. Add powdered sugar and beat until smooth. 2 Responses to "Pretzel Cinnamon Rolls with Cream Cheese Glaze"